As you all probably know, I have a little Etsy shop. I don't have a lot of free time and haven't added anything in weeks, so I have decided to close up shop. BUT- I'm gonna open a new one in January. I'll still be selling the same type of items, but due to several reasons, least of all this book, I'm going to change the name. I'm hoping to be able to put some real effort into it once all this Christmas sewing is done. Because I'm going to mark down the three remaining items to $10 each. I don't want to feel that I have wasted my listing fee, so I'm hoping to sell them before the transfer to the new shop takes place. The three remaining items are all Correspondence Kits. 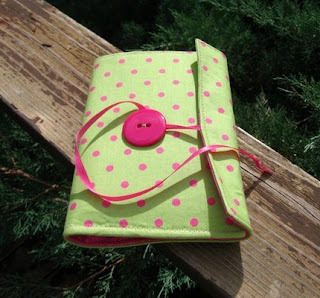 They are a handy little wrap designed to hold a pen and some notecards, and perhaps your address book. If you're looking for a little gift for a teacher or a Secret Santa gift, this is a great idea. I will still be doing custom orders, so if you were interested in a jewelry bag or crayon roll, drop me an email and we'll discuss it.